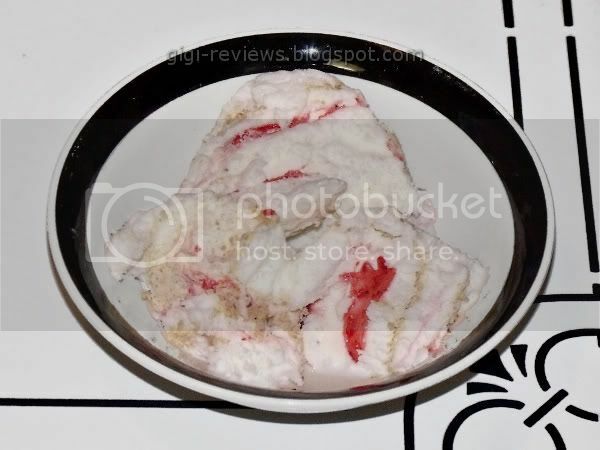 Seeing this carton of ice cream, the combination of a white ice cream and strawberry swirl made me think of those little "sundae" cups that were really popular when I was younger. In those cases, the white ice cream was vanilla flavored (not cheesecake as in this version), and I remember loving them -- even if I knew there was definitely better ice cream to be had out in the big wide world. But I still liked what I had at the time. 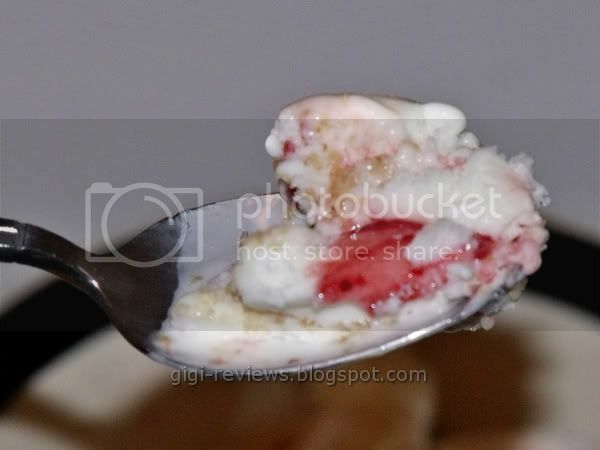 So here I am today with this bowl of Slow Churned Strawberry Cheesecake in front of me. 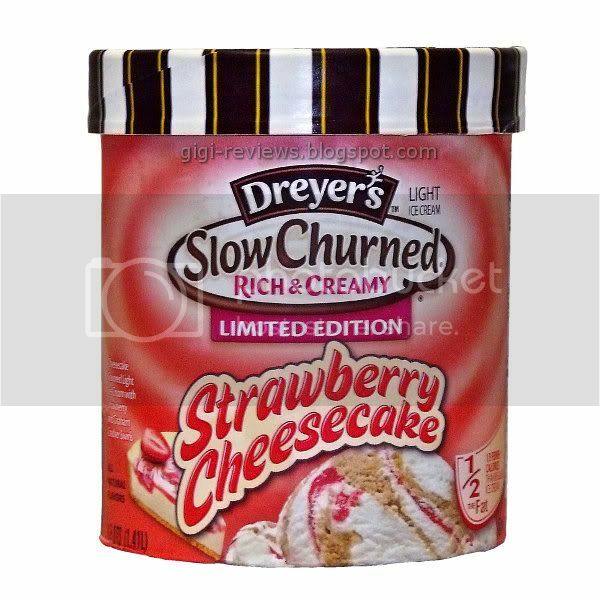 As much as I may bag on Dreyer's/Edy's for the Fun Flavors line, I genuinely like the Slow Churned line. The flavors are interesting and taste good, and for a lower fat, lower calorie ice cream I think they are often excellent. Childhood nostalgia aside, there have been a couple of other cheesecake flavored ice creams that I have loved in the past -- and this just sounded like a good flavor. The base ice cream is cheesecake flavored, and there are strawberry and graham cracker swirls. (I'll admit it -- they had me at graham cracker swirl!) But in the end it really comes down to how it tastes. First, let's talk about the smell. I know it's supposed to be a cheesecake base -- and it does in fact smell like cheese. Old cheese. It's not an overly strong smell, but it's there, and it is not a selling point. Fortunately the taste is better than the smell. It's sort of like a bland cream cheese rather than a proper cheesecake. Even at that, the flavor seems to get entirely lost within the first few bites. The strawberry swirl is just strange. I mean, you can see it -- you can see a lot of it. The problem is you can't taste it. There is a really faint, vague strawberry taste; and weirder still is the fact that it tastes more "red" than actually strawberry. What's the deal, Dreyer's? It's not like a passingly good fake strawberry is all that difficult to engineer. The Graham cracker swirl is nice. It retains a little crunch and isn't too crumby or too soft. It had a nice light honey flavor. Easily the best part of this otherwise horribly lame ice cream. As always, the texture is smooth. While I wouldn't call it "creamy," it is pretty good for a light ice cream. Don't expect that wonderful film that super premium ice creams leave in your mouth, but it is better then most low end "real" ice creams. One of the poorest of the Slow Churned offerings. Skip it. 140 per half cup serving. You are smoking CRACK. Janine, I would try it and see if you like it first. I could eat an entire container of this in 1 sitting. The cheesecakey flavor of the ice cream keeps me satisfied and then when I hit the ribbon of strawberry and graham cracker crust... OMFG.